As more and more people moved to the cities, the baking profession was established. The craft became sought after and, as its importance grew, so did that of the guilds. Bread has been baked since mankind learned to process grain into flour, but the baking profession only came about much later. The first bakers in Central Europe appeared around the 8th century. They were not proud masters, but poor fellows who were forced into drudgery in front of hot ovens. The bakers did not establish themselves as a free profession until 1000 AD, when more and more people moved to the cities. Anyone could do anything and nothing was done right, there were no more recipes and the division of labour became necessary. It took specialists to feed hungry mouths with enough bread, and that was said to be 500 grams (compared to around 200 today) per inhabitant per day. Bakers were, therefore, in demand in the Middle Ages; the profession was sought after and held in high regard. So it was that, in the 12th century, merchant guilds were formed to monitor not only the quality of the goods but also better market access. In the cities, bread could only be baked by a member of the guild. The system was a lucrative one for the bakers, even if they practically worked their fingers to the bone, having to knead dough by hand at night. Very little changed over the centuries, although guilds and guild membership certainly did. They crumbled in the 19th century, under the wave of the Enlightenment. All that remained was the bakers’ guild symbol – the pretzel – which has survived in bakery signs and logos. The reason it represents the baker is simple: the knotted bread represents praying arms. When beer was served at guild gatherings, it would be poured from elaborately decorated jugs. It was true that the more important or richer the guild, the more beautiful the jug. 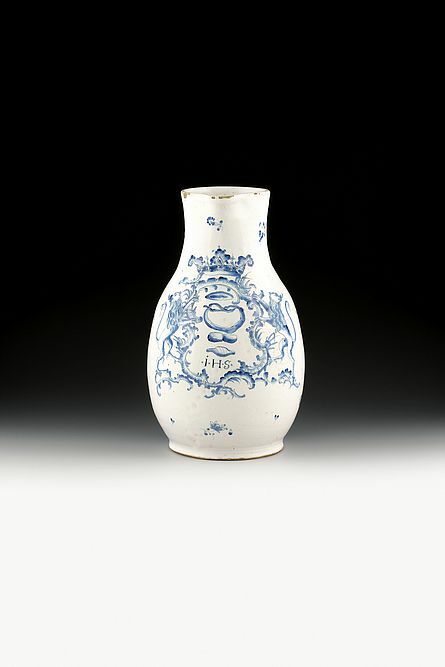 Usually made of tin or glass, this white glazed pear jug (1763/65) from the Ludwigsburg Factory is an exception. While the lions and crowns are general symbols, the pretzels and bread rolls leave no doubt that this jug belonged to the bakers. 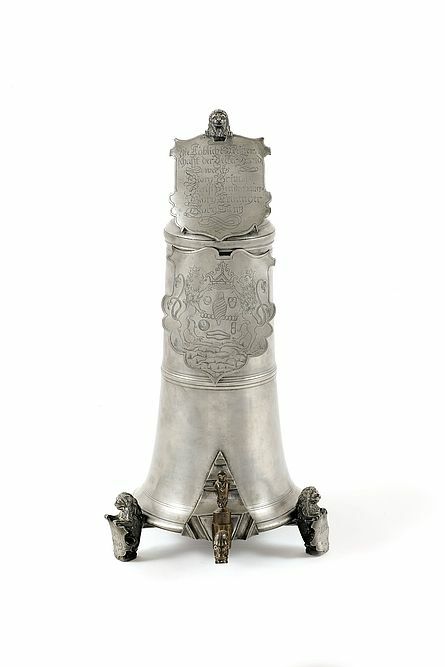 Made of silver, cast, engraved, chiselled and gilded: this covered chalice, which the bakers’ guild in Maulbronn (Baden-Württemberg) commissioned Georg Ignatius Christoph Baur in Augsburg with in 1755, was probably intended to display the words “Löbl. Becken Zunfft” to guests, even before the very first sip. This archaic German saying translates as “the praiseworthy bakers’ guild”. The inscription on the lid sounds unusual today. 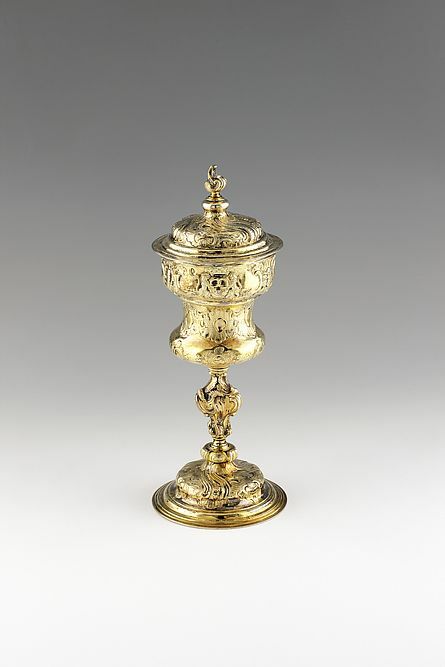 In this respect, the chalice is quite simply called a “cup of health”. The origin of the German word “Schleifkanne” is not clear. To “schleif” something is to grind or drag it. Were these flagons so heavy that they had to be dragged? Or does the word refer to the way journeymen were tormented? No matter where the term comes from, this tin flagon is a magnificent exemplar: lions, shields, landscapes, and even a crown above the bakers’ guild bread emblem. This is how a guild emphasised its claim to power. 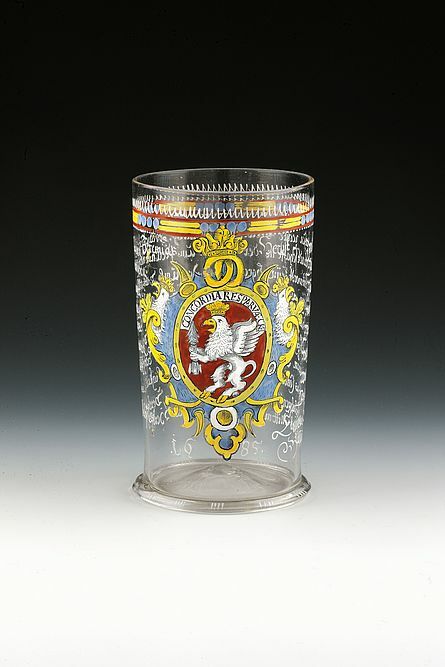 Throughout Central Europe, when guilds received guests, they served beer in guild tankards or glasses. It was a friendly gesture, to which the history of this glass tumbler, belonging to a Franconian bakers’ guild from 1685, may not fit at all. The politically persecuted collector, Rudolf Just, buried his extensive collection, including the tumbler, to protect it from the National Socialists and, later, the Communists. Only after his death, his family dug up the collection in the mid-1990s and put it up for auction. Elaborately worked, delicately decorated with filigree, and yet the exterior of a guild chest did not do its true value justice. 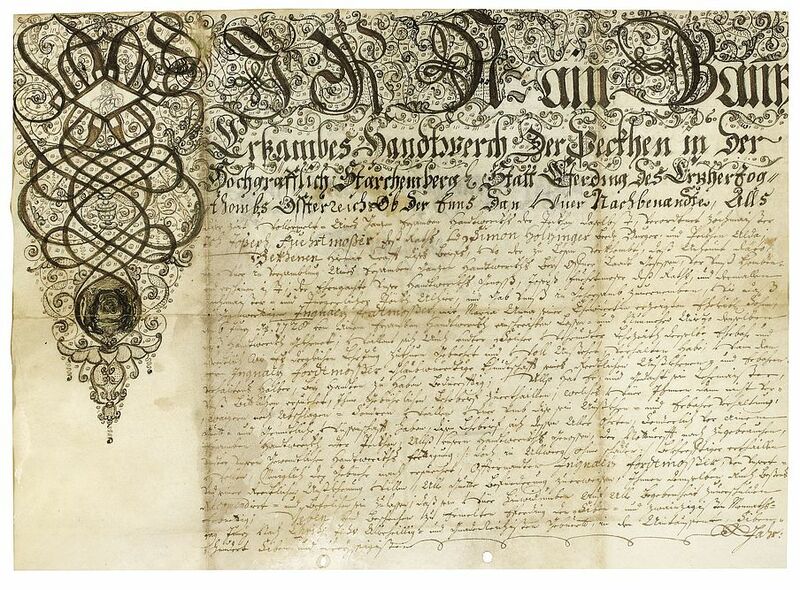 Certainly, the most important documents of a guild – statutes, guild books, seals, privileges – were kept in it, with other valuables. For the guild, however, it also had a ceremonial value. When it was opened, the guild met, important decisions were made, and when a journeyman became a master he had to swear his oath over the open chest. 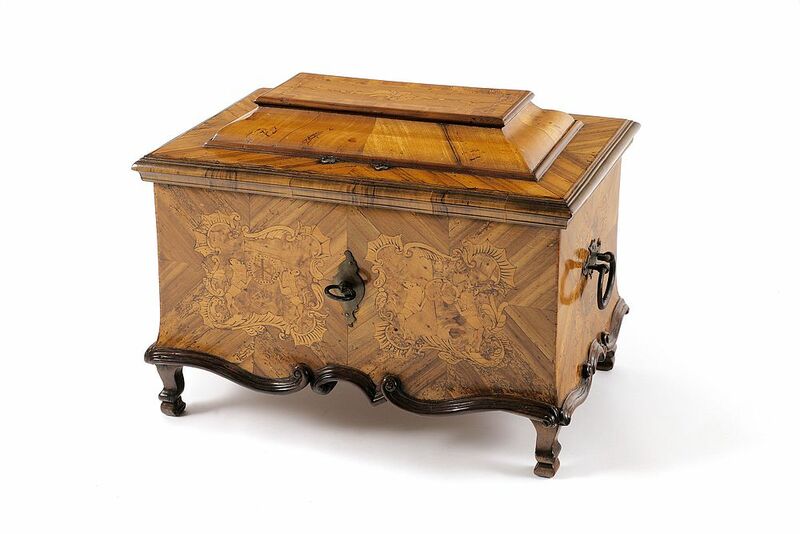 This guild chest – dated 1769 – comes from Southern Germany or Austria. .